Property 3: Quiet location on top of North Downs. Village pub in walking distance. Property 11: Fantastic Inside / Outside Space. A Unique Layout In Central Whitstable. Property 12: Stylish three bedroom cottage in central Whitstable close to beach and harbour. 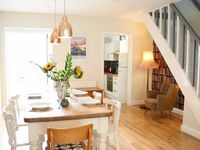 Property 17: Whitstable Cottage: 2 bed, cosy & dog friendly! Property 18: A spacious 2 bed property in town with the added bonus of own car park space. Property 26: Stunning!14 bedrooms, 11ensuites - Panoramic river views! Property 47: Detached house in the heart of Mersea Island.